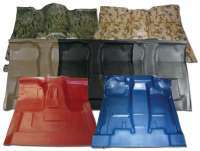 Stock Interiors is proud to offer the highest quality vinyl flooring available for your Chevy S-10 Pickup Standard Cab. Our vinyl flooring is heavy duty, long lasting and cleans up easy. The vinyl is 1/8" thick and is rigid enough to hold it's shape, but yet is easy to work with during installation. Our vinyl flooring comes in a variety of color options for a custom finished look.